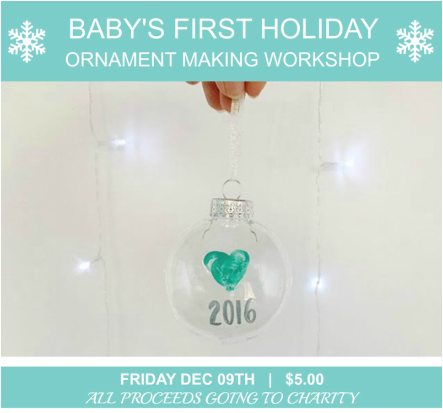 Because of demand - our workshop will be divided into time slots to allow moms and babies the space to make their ornaments in comfort. Celebrate your baby's first holiday with a personalized pretty ornament. Bring your babe and join our ornament making workshop on Friday December 09th, the same day as our Mama Market. Our sample ornament has a heart on it - but supplies will be provided for you to put baby's little hand print or foot print on the ornament. The paint we are using is nontoxic acrylic paint that is water based and cleans up easily with soap and water. Metallic Sharpie pens provided for you to write the year or baby's name. The top of the ornament comes off so you are welcome to continue with the project by filling the ornament - maybe with glitter or mini battery run led lights. $5 with all proceeds going to the Red Door Family Shelter charity. ​All registrations are final sale. I have more than one baby, can I make two ornaments? I have a toddler/kid, can I still bring them to make an ornament? Yes - their hand prints might be too big for the ornaments, but you can still make something beautiful with them. I would like to donate more that $5 to the Red Door Family Shelter. Can I make an additional donation? Yes you can make an additional donation on site and we will bring it to Red Door on your behalf.